Swifts are one of our most iconic birds. They visit us for only three months a year just to breed in our buildings, then they fly off to Africa for the rest of the year, rarely touching down anywhere - they feed, sleep and breed in the air! But disaster is occurring before our very eyes - swift numbers are declining seriously in the UK, as surveys suggest 50% of our birds have disappeared in the last 20 years. The reasons are complex, but the one we can do something about is the loss of nesting places as we seal up our houses and roofs so there are no longer holes for them to nest in. In the Blackwater Valley we should be blessed with Swifts. Our valley is a long stretch of lakes, ponds and wild spaces from years of gravel extraction providing the insect populations the birds need for feeding. At the same time we have our towns alongside to provide the nesting places. 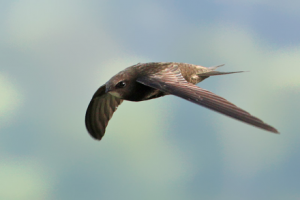 Swifts are largely colonial; they like to nest close to each other, rarely alone. 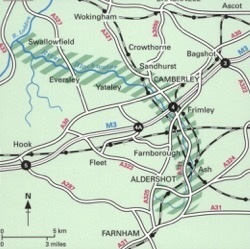 So, if we are to increase numbers we need to find the birds we already have and provide adjacent, suitable nest sites. And that is what this project is about. First we need to find our swifts! The best way to find nesting swifts is to listen for their screaming on spring and summer evenings – hear what they sound like. They spend much of the day high in the sky feeding on aerial plankton but come down to their nests later with food for young forming screaming parties near their nest sites. They will approach the nests very fast and just disappear into a hole - in eaves, wall, towers, churches, and almost anywhere they can find a place at least two storeys high. help to find the birds - here's how to identify them. If you find some screaming or nesting swifts, let us know by using the button below. You can print a form if you want to take one out with you but please use the button to enter the details when you get home. the birds are best attracted by using swift callers, which is an MP3 player and a speaker attached, so we need help to make those too. If you fancy having a go at any of these tasks, email colin.wilson@bvct.org.uk and we’ll be glad to tell you more.